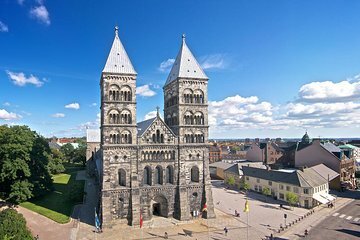 The Swedish towns of Malmö and Lund are perfect complements to each other—Lund is rich with viking history, while Malmö is a hopping cultural hub. This small-group tour from Copenhagen allows you to experience the highlights of both locations alongside a guide, with round-trip transportation for a seamless experience. If you choose, explore Malmö on your own after the tour and return by train (ticket included). Moderate walking is required during the tour. Possibility to stay in Malmö independently after the tour ends. Return trip by fast train, or by minibus if the train isn't operating. The return trip is always included in the price for either mode of transport. The operators reserve the right to cancel the tour should there not be at least 4 people booked. The tour may be canceled due to weather conditions making the bridge crossing to Sweden hazardous. Bring clothes according to weather. Great way to add a quick trip to Sweden when you have a short trip, we had a blast. Petra (our tour guide) was friendly and knowledgeable about the histories of Danmark and Sweden. It was a nice day trip for someone who wants to learn quick about these countries/areas. Anna gave us a great taste of Sweden while we were visiting Copenhagen. In six hours she provided a great general overview of Swedish history, culture, architecture and food. We had a great time on this tour. The guide did a great job explaining the areas we visited and was entertaining. The tour was laid out well and used our time efficiently. I would recommend this to individuals who want a little exposure and explanation of Sweden. Amzing day trip into Sweden. Lots of history. Our tour guide Petra was vwery nice and took us to all the main places. We were really looking forward to seeing the south of Sweden. However, our guide, Anna, was late in picking us up, The van may have been a rental and it was too small for 9 people. Lund was attractive but we spent most of the time at the university and had no time for pictures. We had to drop the van off at noon in Malmo...some of us thought we had the option to return to Copenhagen in the van. We were dropped off for lunch in a warehouse environment but my food was enjoyable. There were lovely restaurants in other places which would have been preferable. Great tour with the weather being the only bad thing. Still would have liked the option to walk in the beach area of Malmo. Trip to Sweden was great. Our guide was very informative and all around fun to spend the day with. Christian was a phenomenal guide! He knew all there is to know about Denmark and Sweden. He was extremely friendly, warm., and funny. The quality of the tour was outstanding. We are so glad, we chose to go on this tour. Highly recommend! Other than a little hiccup prior to the start of the tour that end up starting the tour a little late otherwise the rest of the tour was wonderfully managed. The guide knew Lund and Malmo cities very well and provided us with a very comprehensive historical review of the various locations and sites in both cities.